A special invitation goes out to folks who love to sing but are unable to commit to regular Sunday Chancel Choir rehearsals. Chancel Choir - if you like to sing, you are welcome, whether you can read music or not. For middle school and up. Rehearsals are on Thursday evenings and the Chancel Choir sings at nearly all Sunday services. If you can't get to all the rehearsals, please come when you can. Cantata Choir - For all ages, rehearses 4- 6 Thursday evenings prior to special presentations for special times of the year- in the late autumn (for the pre-Christmas Cantata) and spring (for the pre-Easter Sunday Cantata). Pilgrim Ringers - for experienced musicians, who can read music, and enjoy making fabulous handbell music as a team. 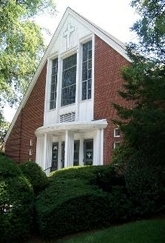 Rehearsal is Thursday evening and performance is once a month in church. 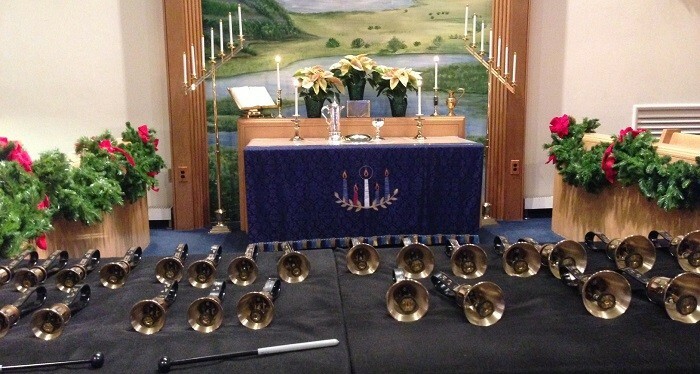 Journey Ringers - for folks of any age or music ability who want to learn to ring handbells. It is not necessary to be able to read music. Sessions will be scheduled at the convenience of the participants. * The Carol & Nowell Choir sings in church one a month and on special occasions such as Christmas Eve and Easter. SummerChoir - during the summer, members and friends are invited to sing in the SummerChoir. There are no weekday evening rehearsals, no robes to wear, and the music is easy and appealing. Instrumental music - we love to include all kinds of instrumental music in worship. Please contact Gloria if you'd like to share your talents! There's nothing like it - ringing in a Handbell Choir! You are invited to join the Journey Ringers, an exploratory handbell group for folks of any age or musical experience.